Dubai Opera, which is set to open in August 2016, is showing good progress with the concrete and steel structure works completed, Emaar Properties said in a construction update. “Ongoing works are vertical transportation, interior fit out, stage engineering, joinery, façade, roofing and metal. There are also other installations such as water features, kitchen equipment, auditorium seating, fit out, MEP and finishing,” the developer said. In March, the company said the Dubai Opera will start holding world-class performances later this year. Located close to Burj Khalifa, the world’s tallest building, and Dubai Fountain, the Opera will be as iconic in appearance as the world-famous Sydney Opera House. “Dubai Opera is our tribute to our city and the vision of His Highness Sheikh Mohammed bin Rashid Al Maktoum, Vice-President and Prime Minister of the UAE and Ruler of Dubai, to establish Dubai as a seat of arts, culture, performing arts and world-class events. An architectural masterpiece, it draws design inspiration from our own heritage, while the focus on bringing exclusive and accomplished performing arts places it on the league of the world’s finest,” Mohamed Alabbar, Chairman of Emaar Properties, had said in a statement. Atkins is the architect while Consolidated Contractors Company is the main contractor for the project. As for Dubai Opera, the Arabian dhow has been the inspiration behind its architecture. 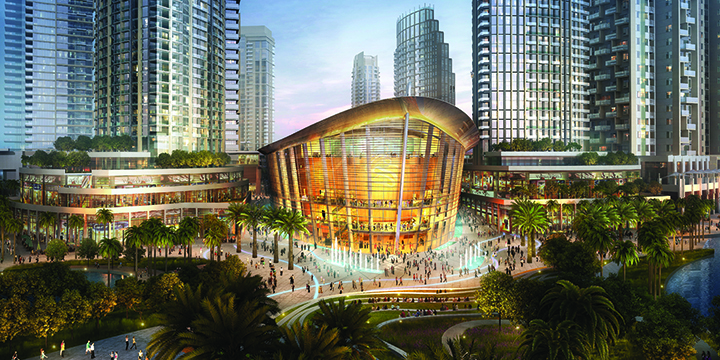 The 2,000-seat, multi-format performing arts venue in the emirate will have the ability to transform into three modes; from a theatre to a concert hall and into a “flat floor” form, becoming a banquet of event hall. In theatre mode the space will be suitable for opera, musicals, ballet and dance performances, large-scale drama productions, lectures and conferences. It will seat between 1,940 and 2,040 depending on the configuration, the company states. Transformed into a concert hall by a series of towers on stage to create an acoustic shell that surrounds the orchestra, reflectors overhead will enhance the acoustics and reflect sound. In ‘flat floor’ mode, the room will cater for a number of events including weddings, with banquet style seating able to accommodate up to 1,000 guests. It can also be configured for trade shows, exhibitions, receptions and parties, the developer has said.